Lancing Football Club chairman Steve Taylor is hopeful they can be fighting at the top end of the Southern Combination League Premier Division this season. Former Worthing United chairman Taylor was unveiled by Lancers last month. It’s been a summer of change at Culver Road with a new-look committee and manager Ash Bailey returning to the club. 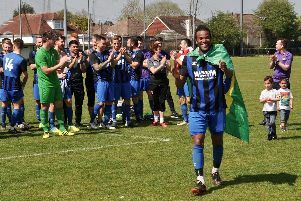 In his previous spell in charge, Bailey led Lancing to a fourth-placed SCFL Premier Division finish and won the Peter Bentley Cup – the club’s first silverware for 26 years –over the 2015/16 campaign. Lancers chairman Taylor admits trying to match the achievements of Bailey’s previous spell may be hard but wants them to give it a go. He said: “I’ve got a lot of admiration for Ash (Bailey) and I’m really excited ahead of the new season. “Ash is someone that knows county football incredibly well and knows a wealth of players. Lancing’s preparation for the new season continued with friendlies against Combined Counties Premier Division Sutton Common Rovers and SCFL Division 1 side Mile Oak over the past few days. Lancers recorded a 2-2 draw in their meeting with Sutton Common Rovers on Saturday and beat Oak 5-3 at Culver Road three days later. The club have sold all the seats on the hired coach they will be using as they make the trip to Newport IOW for their next friendly on Saturday. Taylor said: “We’ve had some different tests in terms of opposition in pre-season so far. “All the seats on the coach we are taking to Newport IOW on Saturday have been sold, so it should be a good day. There’s still some work to do before the season starts but we’re in a good place at the minute. “A few of the squad from last season have remained while some new faces have freshened things up for us. Lancing are relaunching their ladies’ side this season and held an open training session at Culver Road on Sunday. The session was well attended and any new players looking to join can still do so. For more information on the team’s pre-season plans and all things Lancing ladies’ contact manager Jason Downer on 07834 376181.